Though essential for wading in icy waters during Zodiac landings, the proper boots are bulky and heavy. By renting boots, you are guaranteed to have the best boot to stay warm and dry in Antarctica, while gaining space in your luggage. Trekking Poles provide stability while ashore. Our rental poles are lightweight and collapsible, making them easy carry on the Zodiac, which will be your transportation to and from the ship. 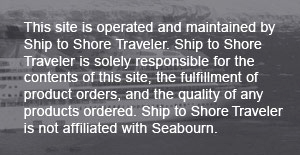 Antarctic rental concierge service, with free delivery to the ship, is available for all Seabourn Antarctic sailings. Orders must be placed 30 days before embarkation date. Orders must be placed up to 30 days before embarkation date. Orders 29 - 15 days before sailing accepted but limited boot sizes are available. Trekking poles availability may also be limited. Rentals are delivered to and picked up from the ship. You will be advised about the procedure for returning your rental gear onboard. Though essential for wading in icy waters during Zodiac landings, the proper boots are bulky and weigh between 4.5 lbs / 2.5 kgs to 6 pounds / 2.73 kgs. By renting boots, you are guaranteed to have the best boot to stay warm and dry in Antarctica, while gaining space in your luggage for expedition gear and clothing. Free boot delivery to the ship is offered through our Concierge Service. Rest assured, all boots are sanitized after each rental using products that have been proven to work in U.S. high-end ski resort rentals. Comfortable, insulated boots are essential for expeditions to Antarctica. The Zodiac Classic High Boots (our rental boots) are the top recommended boot for Antarctic peninsula expeditions and have been tested in Antarctica by expedition leaders. They are flexible, durable and rated to -40F/-40C degrees so your feet stay warm. We have a full range of womens, mens and childrens' sizes available. As former expedition staff and avid outdoor enthusiasts, we care deeply about preserving the pristine regions of the planet for the explorers of today and tomorrow. Renting boots is the right environmental choice when they are unlikely to be worn again.